A pronoun is a word used in place of a noun. Usually the pronoun substitutes for the specific noun, called the antecedent. When deciding which pronoun to use in a sentence, say the sentence aloud or in your head several times using each pronoun. Whichever sounds correct will usually be correct. For example, “Bob and ____ will be going.” You might be deciding whether to use I or me. Saying “Bob and me will be going” does not sound as good as “Bob and I will be going”, so the correct pronoun in this case is I. As Bill Waterson once said, a pronoun is simply a noun that’s lost its amateur status. In reality, pronouns are words that stand in place of nouns. 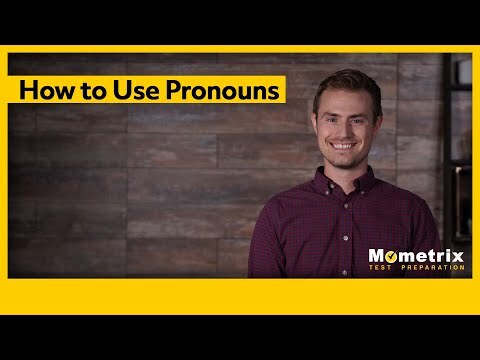 Hi, and welcome to this video on Pronoun Usage. What exactly are pronouns? Well, they help our writing and speaking to be less repetitive, because you don’t have to repeat the name of the person or thing you’re talking about every single time you mention them. At the same time, if you’re not careful with how you use your pronouns, they can actually confuse your reader. You must also make sure that the gender of your pronoun matches that of your antecedent. If you’re referring to a mixed or unknown-gender group or person, you may use “they” or “their.” “He or she” is also acceptable, but many writers find this clunky so the grammatically-incorrect-but-better-sounding “they” is used more often. There are several different main types of pronouns: personal, possessive pronouns, reflexive, demonstrative, indefinite, relative, and interrogative. Possessive pronouns are a subset of personal pronouns. These are used in order to indicate, well, possession. These include: my, mine, theirs, hers, etc. Demonstrative pronouns point to something, as in “I’ll have that sandwich” or “take this shovel and put it over there.” Notice here that the pronoun and the thing referred to exist in the same sentence – the pronoun doesn’t replace the noun with demonstrative pronouns. And that’s we’ve got for now! Hope this was helpful. I’d love a thumbs-up and if you want more videos like this, subscribe to our channel! Thanks for watching and happy studying!